We use an offer form in the State of Massachusetts. Many states go directly to a Purchase and Sales agreement, but we have an introductory step first. What is an offer? It is an agreement between the buyer and seller that gives a basic outline as to the terms of agreement, such as price, timing, financing, etc. Offers are negotiated for hours or days! Your ERA agent will prepare the offer with you. It will be presented to the seller . Once a verbal agreement is reached, the offer is re-written to reflect those terms and then fully executed by both parties. The Purchase and Sales agreement is a longer, more detailed document that will supersede the offer once executed. The P&S is drawn by the listing agent or sellers’ attorney. The P&S is typically executed after the home inspection and it requires an additional deposit from the buyer. Making an Offer: There are several issues to address prior to writing an offer. Your ERA agent will walk you through the process and address all of your concerns. For instance, we want to talk about the septic status of the property, your financing plans, what is the lead paint status on the property, is this home part of a home owners association or is it a condo? We need to talk about your preferred dates to close and any specific information from the seller or their agent. Septic Status and Title V: All (except for a very limited area) homes on Cape Cod are serviced by private septic systems. It is the state law that all septic systems in Massachusetts are inspected by a state licensed inspector within a 2 year window of passing title. If a seller has an inspection and it does not pass he has a 2 year window to install a new Title V septic system or repair the existing system. Massachusetts does not care who owns the home when the 2 years is up. Whoever the owner is at that time, two years from the original inspection that failed the system, the local Board of Health will expect that current owner to replace it. Hence, the importance of the question when you make an offer. You do not want to be responsible for an inspection on a property you may not want to buy. You want the property to be inspected prior to making your decision to purchase and if the inspection should fail the system, you want to know what kind of system can be put on the property and how much it could cost. We help get you the answers to all of those important questions. Sellers Lead Paint Disclosure Form: This form should be provided to you when you make an offer on any property built prior to 1978. This disclosure will tell you what the current seller knows about the lead paint status of the property. If a child under the age of 6 will be living in the house, the status of lead paint is very important to you. Your ERA agent will give you the lead disclosure form and the state information. Affordability: Your ERA Cape Real Estate agent can assist you with finding a mortgage officer. We have several local banks and mortgage companies and we can put you in touch with someone who is familiar with the local market and available financing plans. ERA Mortgage guarantees rates, offers free pre approvals and paperless applications. How to Search for a Home? www.capecodera.com, as well as our very own company app (which can be downloaded from our website), is all you need to search all of Cape and Islands MLS. Your ERA Cape Real Estate agent will plug you into automatic updates, alerts, etc. to keep you on top of the market. What does an ERA Cape Real Estate agent offer you in your home search? Good agents keep searching till they find the home of your dreams! They don’t give up the search, and for many buyers the search lasts for months or even years. More isn’t always better in terms of agents. A common fallacy is thinking that if you work with 5 agents you get 5 times the attention. Good agents do not limit your exposure to any particular house, whether it’s our company’s listing or another MLS company. Good agents ask questions because they need to be sure that you are financially prepared to buy the home of your dreams without wasting valuable time. Good agents won’t betray your trust. They know if they take care of you, the commission takes care of itself. Once you find the right home, our work really begins. We walk you through the inspection process, we help with mortgage information, we can point you to the right town halls and offices for questions and concerns about zoning, building permits, board of health issues, etc. We keep track of all of your contingency dates and we bring you to the final walk-through before the closing. We attend the closing and represent your best interests. Agency Relationships: In the state of Mass. Real Estate agents have options as to agency relationships. We can practice Designated Agency or Seller/Buyer Agency. Here at ERA Cape Real Estate we offer Designated Agency. That means that we can offer consumers either Sellers’ Agency or Buyer’s Agency within our company on the same transaction. One agent in the company can be the listing agent, and one agent can be the Buyer’s agent. That one agent is the Sole representative for their client. We do offer Dual Agency in specific circumstances and your ERA Agent can explain that to you in detail. We respect all of our client’s private information and we hold their confidence in the highest regard. 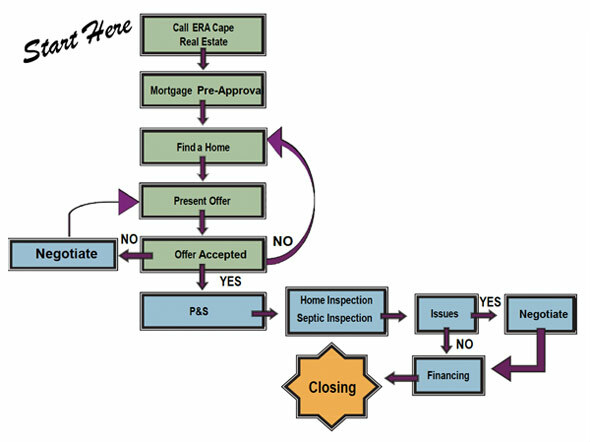 ERA Cape Real Estate can give you all of the information you need to make an educated decision in the home buying process. Give us the opportunity to work for you! Financing: Your financing needs should be addressed in a financing contingency clause, which will specify dates to obtain financing and state how much of the purchase price you want to finance. Your ERA Agent will provide you with names of banks and mortgage companies and give your loan officer all of the information they need. Home Inspection Contingency: All offers should reflect a home inspection contingency unless there are very unusual circumstances. This gives you a date by which to fully inspect the property for any issues: mechanical, HVAC, roof, pests, etc. Once you have your inspection, you can approach the seller with concerns or ask for the seller to repair an item or ask for a credit to address the issue after closing. The seller can say “yes” or “no”. The buyer then has the option of continuing with the sale or voiding the sale based on the home inspection. Your ERA agent will walk you through the home inspection issues and communicate and negotiate with the seller or their agent. Additional Contingencies: You may have a specific concern about a property. For instance, can you add on to the house with another bedroom? We can build in a “due diligence” clause so that you are protected and have the right to take the time to get the answers from the local building department. All of these issues should be investigated prior to making your offer, and your ERA Cape Real Estate agent will keep your best interests in mind by making sure that you are protected as much as possible. Home Warranty: We offer a home warranty on many of our listings. We can offer you a home warranty on a home even if it’s not covered by one when it’s listed. Ask your agent how a Home Warranty can give you piece of mind and save you money. Insurance: Home owners insurance is a must. Banks will demand a policy prior to closing. We can give you a referral for insurance companies here on the Cape. Due to the proximity to water, many properties on Cape Cod have limited insurance options and most have to go to Massachusetts FAIR Plan (Fair Access to Insurance Requirements). This is a state insurance plan that must offer coverage to properties that independent insurance companies refuse to cover. Flood insurance is offered by independent insurance agents, through the National Flood Insurance Program. There are limits to what you can purchase, ask your insurance agent for the information. Do you have an attorney? We will contact him immediately and upon your request, present the offer to him prior to presenting it to the seller or listing agent. We will work with your lender and confirm dates for a financing clause and any special requests for closing costs, etc. We will communicate on your behalf with the listing agent and keep you fully informed of all aspects of the transaction. Once it’s time for the closing we will confirm the closing date and time, attend the walk through, make sure your closing attorney has a copy of the smoke detector certificate, town water bill, septic inspection report, etc. We will review the HUD with you and your attorney and attend the closing. Where to begin? If you plan on financing a property, start with a mortgage pre-approval. Your mortgage lender of choice will help you decide between mortgage programs and provide you with guidance on how much you can borrow and under what terms. As your agent, we can provide you with lender names and contact information if you are looking for a local lender. Once you know how much money you want to spend- let’s go house hunting! Your ERA agent will give you a thorough view of the current marketplace and show you all that is available that meets your criteria. Once you locate a property that suits your needs, the next step is to make an offer. What is an offer? An offer is from the buyer, and it outlines the terms and conditions of the sale. Once the offer is made and presented to the Seller, the Seller has options. They could just say no or they could simply say yes and sign the offer. The third option and certainly the most popular is to “counter offer”. They will respond to you with different terms and conditions and you have the opportunity to respond. Typically that is done verbally and it may last for hours or days! That being said, until you have the offer executed (signed) by the Seller, you have no agreement. If you and the Seller come to a meeting of the minds during negotiations, you will both sign an offer with the agreed to terms. If you want your attorney to review it, we will forward the offer to them. When the seller signs the offer, you will then have a fully executed, legally binding contract. Your deposit check for the offer will be cashed. What’s the next step? A Purchase and Sales agreement. What’s a Purchase and Sales? It is the detailed agreement between the parties which will supersede the offer, once fully executed. Before you are asked to sign it, both your attorney and the Seller’s attorney will have time to make additions or changes to it. Once you sign the P&S agreement, it will be given to the seller with your P&S deposit check, for their signature. Your offer would have been written with certain contingency dates. The typical contingency dates are for financing, home inspection and septic inspection. How do those dates impact the offer and P&S? While all parties are operating with a fully executed offer, prior to the P&S, the Buyers will order the home inspection and fill out their loan application. The seller is usually required to have a septic inspection – if it had not been done prior to the writing of the offer. The P&S execution date is normally AFTER the completion of the home inspection and septic inspection. Obviously if the inspections produce unanticipated results and the Buyer wishes to void the sale, there is no reason to proceed with a P&S. The P&S should address in writing any issues from the home and septic inspection. Home Inspection contingencies are designed to give you all the information you need to make an informed choice about the condition of the property prior to entering into a P&S agreement. If you and your inspector find something you cannot live with, the contingency allows you to void the sale by a given date. Your ERA agent will review your home inspection concerns with you and relay them to the Listing agent and Seller. Your financing contingency date is typically after the signing of the P&S. You are responsible to respond to all requests and requirements of the lender. If the mortgage contingency date approaches, and you do not have a loan commitment, you could conceivably lose your deposit funds if you are unable to close on the property. Your loan commitment date is important. Your ERA agent will help you prepare an extension request if need be, or a request for return of deposit, under the terms of the P&S, if you feel your loan commitment will not be forthcoming. Once the P&S is executed, all inspection concerns met, the mortgage commitment received, and any other contingencies taken care of, we are ready to prepare for closing! Your closing attorney, along with your ERA Cape Real Estate agent, will orchestrate the walk through and all closing details.